floods mainly in coastal areas, and mid-term or severe drought in other regions, are well documented (IPCC, 2007; Chang and Franczyk, 2008; Dukes et al, 2009). These changes are not uniform (Motha, 2007). 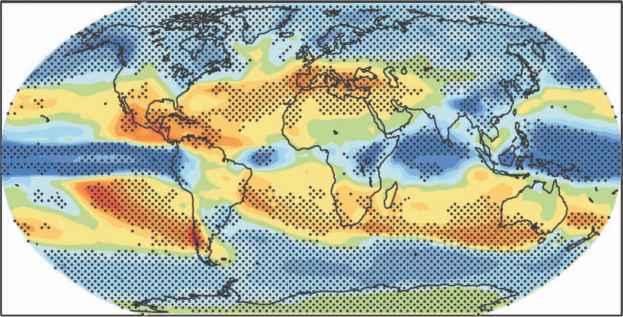 The temperature increase is widespread across the globe, but greater at higher northern latitudes. Predictions indicate more droughts in southern Africa, more wet periods in eastern Africa and no clear trends in western Africa (Sanchez et al, 2009). Since plant diseases reduce crop performance and are considerably affected by environmental parameters, it is likely that major changes in ecoclimatic conditions will lead to changes in plant disease frequency and severity, threatening the quantity and quality of agricultural products (Mestre-Sanchis and Feijoo-Bello, 2009). Several reviews highlight the growing concern for the potential impact of climate change on plant diseases (Manning and von Tiedemann, 1995; Coakley et al, 1999; Chakraborty et al, 2000, 2008; Boland et al, 2004; Garrett et al, 2006; Dukes et al, 2009; Gregory et al, 2009). New cropping practices, globalization and international trade have a rapid effect on the plant disease spectrum. Recent climatic changes undeniably observed worldwide give a new dimension to the evolution and distribution of plant pathogen populations resulting from crop intensification and long-term climate evolution. This makes it even more likely that plant disease evolution and its control will require increased emphasis in the future under changing climate scenarios. Although the epidemiology of many plant pathosystems (Robinson, 1976) is now better understood, it is difficult to separate climate change effects on the parameters affecting plant disease from normal seasonal variations. The effects of global climate change on plant diseases are subtle, progressive and difficult to document because of the scarcity of long-term data sets (Jeger and Pautasso, 2008), resulting in uncertainty about possible future scenarios. Conclusions about a specific crop disease are often deduced from limited studies on one or a few specific physical variables (e.g. temperature, CO2 concentration and drought) conducted under controlled condi tions, whereas multiple interactions occur in the context of climate change (Jahn et al., 1996). Studying and understanding the drivers of change are essential if actions are to be implemented that prevent or reduce their impact. In this chapter we focus mainly on factors affecting plant diseases and pests from the perspective of agroecosystems and food crops. Among these factors, increasing temperature and variations in total relative air humidity, total water availability and rainfall patterns are likely to have a major effect on plant diseases and pests. Before discussing how these variables affect plant pathosystems, we look at the concepts underlying plant disease and epidemics. The diversity of the effects of climate change - driven by evolutionary forces - on populations of microorganisms, pests and plants, cropping practices and yield are illustrated by recent examples of food crop diseases and damage. Strategies are outlined for mitigating emerging challenges resulting from new and potential epidemics affecting major crops.